As newcomers enter the South Okanagan, SOICS provides them with the tools to help them adjust to their new lives in our community. Through a series of workshops, the Life Skills Development Program enables participants to obtain the knowledge and skills necessary to adapt to and make connections within the area. Skype is a way for people to communicate with each other all over the world. For new immigrants, this is the perfect way for them to stay in touch with their friends and families. With this in mind, one of our volunteers offered to come in and present a three session workshop series where he showed attendees how Skype works, how to set it up and how to use it. Making sure the computer is operating at full capacity is very important. Part of this process is to clean it up regularly. This was therefore a very informative workshop for all the attendees. No computer is invincible. Therefore it is imperative to always back up your computer, so that the information is not lost. This workshop explains the different methods for backing up your computer. Knowing the basic functions of how to use Windows is something that is very difficult for those who were not previously comfortable using a computer, especially if English is not their first language. This step-by-step guide is an invaluable resource for clients to learn computer terminology as well as the different computer functions, which many of us take for granted. In June 27, 2015 PDMS/SOICS hosted a Dental Hygiene/ General Dental Health Workshop for parents, grandparents and children on June 17th at the Penticton Office. Participants also learned about local dental health care resources. Interior Health’s Dental Hygienist, Karl Gunderdson, visited PDMS/SOICS to share his 20 years of expertise with us from 3:00pm to 4:30pm. Karl specializes in dental hygiene for children ranging in age from 0-5 years old. According to Karl, it is important to help your children properly brush their teeth as he demonstrated to us how most children improperly brush their teeth. Karl also shared a flossing technique made easy for little ones, which he is open to showing to anyone who visits him at the Penticton Health Centre across the street from the hospital. Additionally, Angie Eneas, the Settlement Worker in Schools (SWIS) and Karl Gunderson shared information on what questions to ask Dentists if you don’t have a dental plan. Dental visits can be very expensive for families and many dentists in town won’t see a new patient just to fix a tooth, etc. They will insist that you get a full check-up, which can be very pricey. If you ask the right questions however, and make it clear to the dentist what your needs are and your budget, some dentists will help you. The group also discussed how to make sure that you see the dentist who is right for you and your family, especially if you don’t have a dental plan yet. Some dental offices only specialize in certain areas like braces, which can make them more expensive or more affordable. Our SWIS worker and Karl shared other resources in the community, such as Penticton’s emergency dental clinic for low-income people and families. If you’re ever in doubt about a dental problem being an emergency, you can also go directly to the hospital. This workshop was presented by Joelle Mbamy from Sunrise Pharmacy who brought in a team of health workers to administer blood pressure and glucose checks on our clients. Through her presentation, Joelle made our attendees aware of how closely connected high blood pressure and diabetes are and how prevalent they are amongst seniors in our community. Participants were surprised to hear from the team that people with diabetes are more likely to also have high blood pressure or hypertension and that high blood pressure can increase the risk of diabetes complications such as kidney problems. The two-hour workshop also covered topics about what the blood pressure should be if a person has diabetes, what the symptoms of blood pressure problems are and how one prevents high blood pressure. Joelle is an immigrant herself and understands how newcomers are prone to ignore their health while they are busy starting a new life in Canada. SOICS offered a workshop addressing chronic disease, nutrition, and lifestyle habits among South Asian clients. The workshop targeted the Punjabi-speaking community in Oliver and Osoyoos and was presented by Anneli Laws, Chronic Disease Nurse and Marie Goyet, Registered Dietitian, from South Okanagan Regional Hospital. One of PDMS/SOICS Punjabi-speaking staff members provided interpretation during the entire workshop. The nurses approached SOICS to see if we could help them connect with more South Asians in this community, to increase awareness about the prevalent diseases in the South Asian community and ways to prevent them by changing their eating habits. They brought to our attention a recent study (Type 2 diabetes in South Asians: similarities and differences with white Caucasian and other populations) indicating that while all ethnic groups are affected, the prevalence of Type 2 diabetes in South Asians, both in their home countries and abroad, is extremely high and is continuing to rise rapidly. “Innate biological susceptibilities coupled with rapid changes in physical activity, diet, and other lifestyle behaviours are contributing factors propelling the increased burden of disease in this population. The large scope of this problem calls for preventative efforts at both the individual and population level that are aggressive, culturally sensitive, and start early.” With one of SWIS staff members, the nurses created the first of what was envisioned to be a series of workshops. It received attentive response from 24 Punjabi speaking clients. Clients who hadn’t attended came in to ask when we would host another workshop. It was brought to our attention that the city of Penticton is going to start charging $1.00 postage for each city bill that they mail out. In order to receive online e-bills at no extra charge, it is necessary to sign up to MyCity Online. For many of our clients, this is a daunting prospect, either because of the language barrier or because they are uncertain when it comes to using the computer. Therefore, the workshop was designed to help our clients learn how to sign up and use the website as well as to inform them that other utility and credit card providers charge for these services. 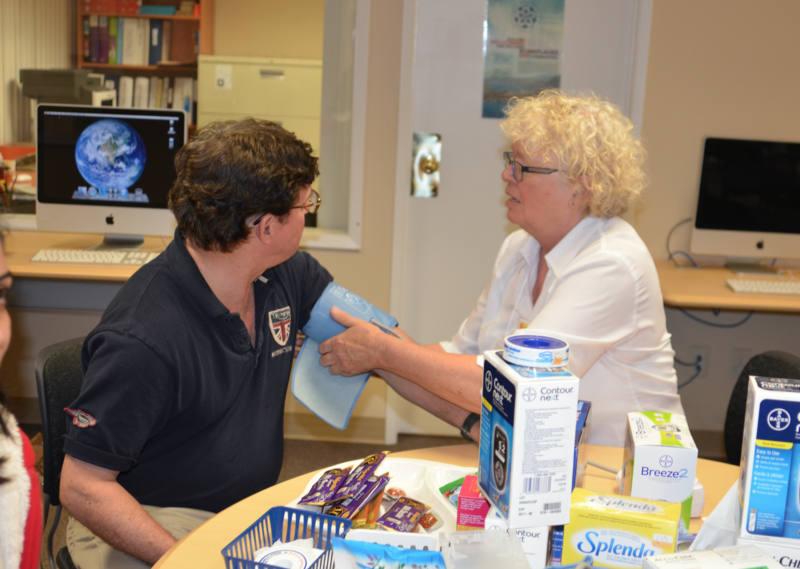 Once a year, SOICS partners with Sunrise Pharmacy, who sets up a flu clinic in our Penticton office. Besides administering the flu vaccines at no cost, the pharmacists provide relevant information, take blood pressure and check blood sugar levels. Through this process, clients learn the benefits of vaccination and how important it is to monitor our health. Prior to taking the flu vaccine, clients receive guidance on how to understand and fill out the Influenza Vaccine Consent Form provided by the pharmacy. In 2014, the Oliver Healthy Living Coalition (OHLC), as a partner member of the Okanagan-Similkameen Healthy Living Coalition, received an Environmental Scan of the Oliver and Osoyoos area prepared by fourth year students of the Faculty of Management at UBC Okanagan. The report examines and assesses a range of food-related issues and resources impacting this area. PDMS/SOICS has been a member of the Coalition since its inception and is using the report to address needs in the immigrant community. The report recommends that nutrition education, food preparation skills, and improved eating habits continue to be encouraged in schools, and further expanded to older populations. Due to the diverse background of our clients, it is not easy for immigrant students and parents to quickly develop a taste for the various kinds of food available in Canada, which are quite different from their traditional food. They partly keep their old food patterns and partly switch to new ones. Sometimes this combination does not make a healthy and complete meal. Schools expressed their concern for students from immigrant families not bringing healthy lunches. With the help of a Chronic Disease Nurse and a Registered Dietitian from South Okanagan Regional Hospital, we held the second in a series of healthy living workshops, focusing on nutritious foods, reading labels and providing healthy lunch options for school children. They explained and practically demonstrated different methods of preparing healthy food for their school going kids and their families. In the last part of this workshop, participants were encouraged to taste various kinds of new products having great food value that were totally strange/unknown to them. As with the first workshop, Dietary Guidelines and Exercise, participants asked many questions and expressed an interest in learning more about maintaining healthy lifestyles. Working towards introducing fitness ideas to our clients, we aim to tie into the age-friendly outdoor fitness circuit being planned for 2015 by Oliver Parks and Recreation and OLHC. Interior Health staff benefit from reaching newcomers and clients have agreed that the information they are receiving is worthwhile. By focusing on workshops that engage clients, we hope to increase the awareness of our office as a centre for valuable information so that clients will anticipate and attend workshops and programs more readily. A local physician in Oliver had shared findings with IH that there seems to be an increase in the number of pregnant mom and young children with low level of ammonia. He shared his concerns of anemia in young Indo- Canadian children. A registered dietitian from Interior Health and a public health nurse from the Oliver Health Unit approached us for a possibility of hosting a workshop in Oliver. 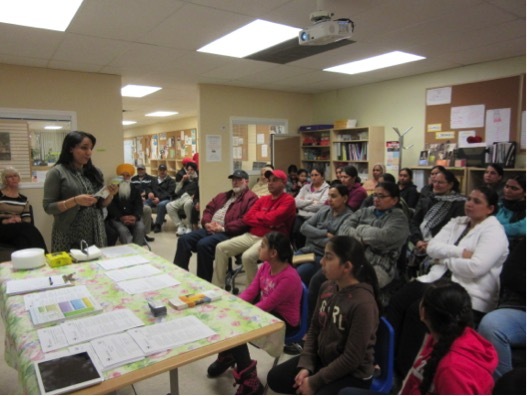 A Punjabi speaking registered dietician from HealthLink BC was invited to lead the workshop. In partnership, we delivered the workshop and aimed to reach out to Indo-Canadian families in Oliver and Osoyoos BC to promote best practices relating to early years nutrition for infants, toddlers and expectant mothers. The facilitators from Healthlink BC, Oliver Health Centre, and Interior Health organised culturally appropriate key messages along with available translated materials for the participants. The workshop promoted the importance of iron rich foods and address common practices that impede optimal iron status such as delayed introduction of high iron foods during infancy, low intake and limited variety of high iron foods, reliance on a vegetarian diet and consuming large amounts of fluid milk. In June 2014, another of our Healthy Living and Wellbeing Workshops was delivered by Karl Gunderson, one of our community partners who is the Oral Health Care Coordinator from the Penticton Health Centre. He gave our attendees some valuable information on oral health and how best to receive it in rural areas. The presentation highlighted some important parts of overall health. It included information on how good oral health contributes positively to our physical, mental and social well-being and to a better enjoyment of life. Dr. Gunderson stressed the fact that brushing and flossing, following a healthy diet, and visiting the dentist regularly are all part of ongoing oral care for healthy teeth and gums. Integration has many layers and there are a lot of things that new immigrants have to learn and understand in order to live in Canada. The Canadian tax system is one of those aspects of Canadian life that cannot be avoided. Walter Harder is an accountant who has had a lot of experience helping new immigrants with their taxes. Every year he willingly donates his time to assisting low-income clients with their tax preparations. He instructs them on what to bring, they have to make an appointment (another vital ingredient that many newcomers need to learn), helps them understand what is involved and ensures that their returns are done correctly. Heads up for a Healthier Brain. Laurie Myres from the Alzheimer’s Society in Penticton came to educate our group on how to detect the symptoms of dementia and how to keep a healthy brain. Her presentation provided information on how to understand what is and what isn’t normal memory loss, the causes of cognitive decline, and how to identify the different types of dementia. She suggested that the more you understand about dementia, the more you can do to improve your outcome and preserve your sense of control. She also shared that certain types of dementia can be treated or reversed if caught in time.